My friend Taiye finally had a break during her international book tour and was making lunch at her place. I wanted to pick up some flowers. I went to my flower stand in Campo dei Fiori but none of the flowers I had in mind were in season. Instead, I decided to go with some peperoncini. So simple, including the presentation. I love the burst of color they bring to a room on a cold fall day. I plan to pick up some red ones later in the week. If you haven’t read Taiye’s critically acclaimed book, Ghana Must Go (La Bellezza Delle Cose Fragili in Italian), get thee to a bookstore or online. It’s fantastic. 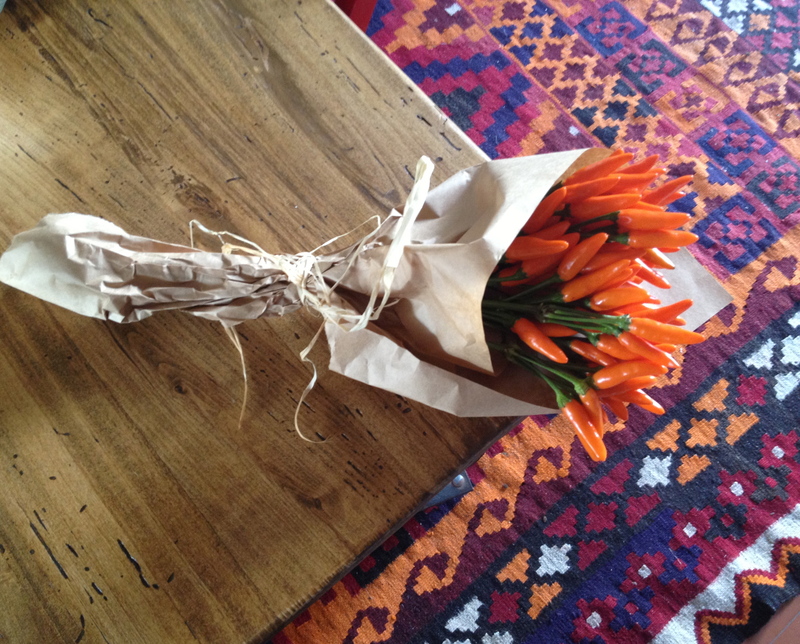 I love this new trend of using peppers in floral arrangements! I bought some orange ones yesterday. So pretty. Previous Previous post: Castello Di Fumone – Design Inspiration, An Imprisoned Pope, and Drowned Non Virgins.